Introducing 1st Farming Fun from TOMY, a perfect way to grow your little one's first farm collection! All vehicles, figures, animals, and accessories are the perfect size for little hands to easily grasp and play with, making it the ideal first farming set. 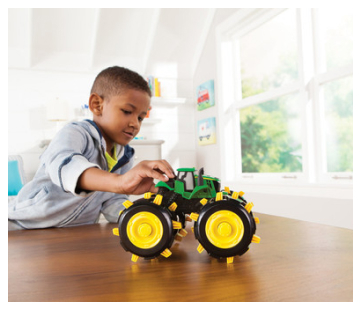 The Harvest Time Playset includes 16-pieces featuring a John Deere Combine. Introducing 1st Farming Fun from TOMY, a perfect way to grow your little one's first farm collection! All vehicles, figures, animals, and accessories are the perfect size for little hands to easily grasp and play with, making it the ideal first farming set. The Harvest Time Playset includes 16-pieces featuring a John Deere Combine. Create real harvesting action by pivoting the unloading auger back and forth, push along the combine to make the head rotate and the grain pivot back and forth in the hopper. You also receive a farmer, goat, horse, chicken, hay bale, apple crate and 8 pieces of easy-to-assemble fence. All accessories and figures are compatible with other 1st Farming Friends. Be sure to check out the 'Tractor Fun Playset', 'Load Up Playset' and add more farm figures with 'Playset Friends' to create the ultimate 1st Farming Fun for your little one. Ages 12 months and up. Produced by TOMY and officially licensed by John Deere.